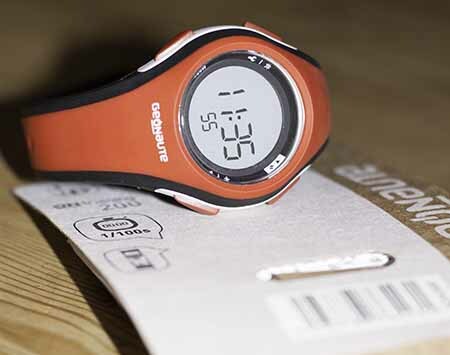 I really like the simplicity of this ‘training’ watch that I found at Decathlon, that wonderful French sports emporium. We’d bought a similar watch as a present of a friend of one of the boy’s last year, and I’d kicked myself for not getting one then… given is was the princely sum of 18-or-so Euros. So a whistlestop visit to another Decathlon in February  meant a chnce to pick one up. Aethetics and watches are important to me and, despite it’s garish red shades, I love the streamlined design and symmetry of the buttons. In terms of functions, aside form the time and date, the watch has split/lap time, countdown and alarm… more than enough in a watch. The buttons are easy to operate with ‘thick’ or cold fingers, and worked well when I was skiing last week. The set-up ‘menu’ is a tad quirky, but not so hard that you can’t muddle through without the instructions. The strap is sturdy albeit plastic moulded to the main watch, so that will limit the watch’s lifespan – when the strap breaks, it can’t be replaced. All in all though this is a nice bright watch that brightens up a dull day.